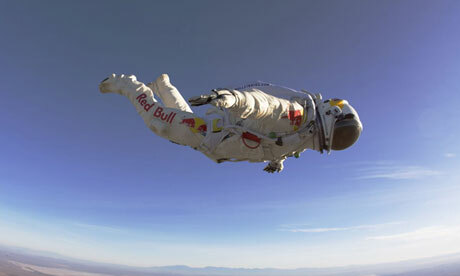 Felix Baumgartner took a small step today and fell 128,000 feet. Thus breaking Joe Kittinger’s 52 year record for the highest sky dive in history. Baumgartner on a test dive. Born in Salzburg, Austria, in 1969, he began skydiving when he was 16, polishing his aero-acrobatic skills in the Austrian military’s demonstration and competition team. A helicopter pilot and extreme sky diver and daredevil, Felix has made a career out of a series of on-the-edge stunts. In 1999, he jumped from the Petronas Towers in Kaula Lumpur, Malaysi, setting a world record for base jumping from a building. On the opposite end of the scale, completing the world’s lowest ever base jump from the 30m-high arm of the Christ the Redeemer statue in Rio de Janeiro. Before jumping he placed flowers on the statue’s shoulders as a sign of respect. He then became the first person to fly across the English Channel. Without an airplane. He used a pair of carbon fiber wings. He has pioneered the use of a “Flying Suit”. He is trying to be the first person to land a Flying Suit and not use a parachute. The jump was aborted on Tuesday and then again on Thursday due to wind conditions. But on Sunday 14 October, 2012 Felix took a small step into History. Col Joe Kittinger (USAF Ret.) was on hand in Roswell, New Mexico for the jump. He was in radio contact with Baumgartner as the CAPCOM (Capsule Communicator). It’s official, at the time of this writing, Baumgartner has set the world record for the fastest skydive by breaking the sound barrier with a top speed of Mach 1.24 ( 833.9 mph). The privatization of space continues as Baumgartner’s jump is a milestone for the development of a system to allow crews aboard the International Space Station to “Bail Out” in case of an emergency. The live stream of Baumgartner’s jump received over 7.1 million views surpassing the 500,000 YouTube live stream views record for the London Summer Olympics. Today was also the anniversary of Chuck Yeager breaking the sound barrier for the first time. Oddly enough it was the first time. Read here to find out who beat Yeager through the sound barrier. I guess Red Bull really does give you wings. He is America’s first astronaut. Anyone over 100,000 feet qualifies for wings. Greetings from Idaho! I’m bored to death at work so I decided to check out your blog on my iphone during lunch break. I enjoy the information you present here and can’t wait to take a look when I get home. Magnificent web site. Plenty of useful info here. I am sending it to a few friends ans additionally sharing in delicious.